Save over 10% when you buy the Power Tool Kit compared to purchasing the items separately (Regularly $34.97). Power tools have a common problem; the cast iron beds will rust if left untreated. This Power Tool Kit will allow you to spend more time actually using your power tools rather than dealing with rust. When your tools are extra rusty, a little elbow grease with a fine abrasive pad will help you remove the rust. 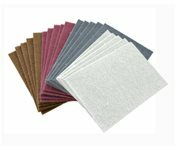 This kit includes Norton pads which measure 6" by 9" and are perfect for working the large cast iron surface found on table saws, bandsaws, planers and jointers. 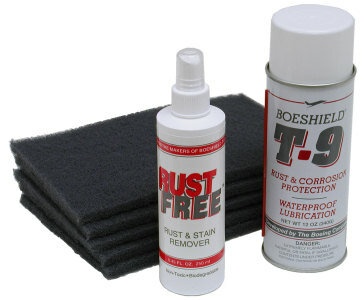 (View Abrasive Pads Separately) Follow this up with an application of Boeshield T-9 to protect your tools from further corrosion. This kit contains a 8.45 fl. oz. spray bottle of Rust Free, a 12 oz. aerosol can of Boeshield T-9 and 5 large abrasive hand pads. This kit was designed for use on cast iron power tools but works equally well on just about any metal surface.